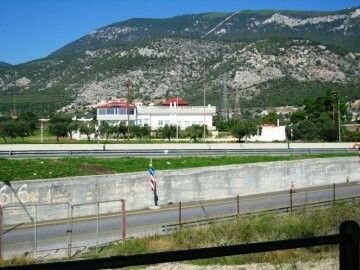 FSBO Homes for Sale: For Sale By Owner Home - Attica 19100 Greece. Gorgeous spacious high technology antiseismic 3D reinforced concrete construction 2-1/2 level villa in Kineta Attica Greece. 7 bedrooms 4.5 baths 4843 sq. 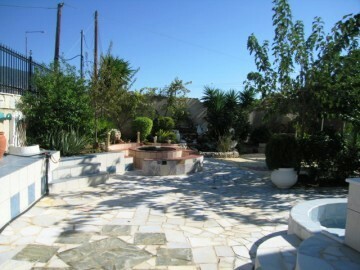 ft of living space situated on 1300 m2 lot. 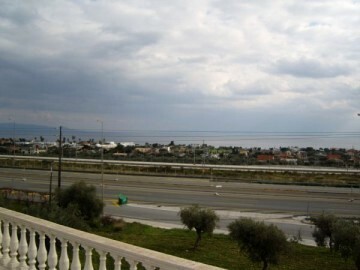 The house has a panoramic view of the Saronikos Sea and the Gerania mountains. The distance from the house to the suburban train station (Proastiakos) is 200 meters or 650 feet, train take 40 min ride to Athens and 55min to the Airport. 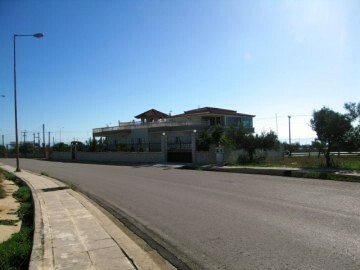 13 kilometers east from the house is the city of Megara and 8 kilometers west from the house is the city of Agii Theothoroi both towns have everything a family need post office, banks, super market, church, fournous (Bakery) souvenir stores, restaurants all over. There are 5 bedrooms with full bathroom, kitchen, large family room with one wood-burning fire place well lit and contains abundance storage. Note: Some of the rooms are able to be converted to gym, office, or any other utility rooms. There is a two car attached garage with electric door opener a bath and shower. On this level there is very large foyer with large marble floor area that greets you as soon as you step through the front door. There is the master bedroom with bath and private balcony and mountain view , next is the No.2 bedroom with bath and private balcony with a mountain view, there is a very long hall with a gust bath, a large half round Eat-in-Kitchen with many windows face the sea there is a door to all around balcony, the family room is next to the kitchen with a large windows face the sea, large formal dining room with a wood burning fire place and view the sea, large formal living room with many windows has a woof burning fire place and view of the sea. This level is above the kitchen approx. 60m2 area has a good view of the entire second level also there are windows face the sea and the mountains, this unique level has a small bar a TV area and office area, the door take you in to glass enclosed balcony with panoramic view of the sea and mountains the balcony has a door to the roof top and gazebo with spectacular all around view. The yard requires only minimum routine work and provides a great place for the kids some of the yard is paved with marble slices plates, peripheral the yard has a concrete walls the front wall is decorated with stones and 1mtr high iron design railings, the back of the house has 1.5 mtrs high iron railing, there is a 4.5 mtrs long iron sliding electric opener door for the car entrance. There is a abundance storage shade house for yard tools etc, also next to the garage is the boiler room, included in the Yard is a build in barbecue and wood burning oven. 3 klmtrs after the 3rd tunnel you see sighn Korinthos AG. Theodoroi Kineta Exit here Kineta go down to the end and make right to the end of the road about 100 mtrs make right again the first house on the right is the House 4 Eleftherias.